Food Tour Karst region invites all foodies and wine lovers to experience Karst region through its mouth-watering cuisine! Treat your taste buds in Karst region. 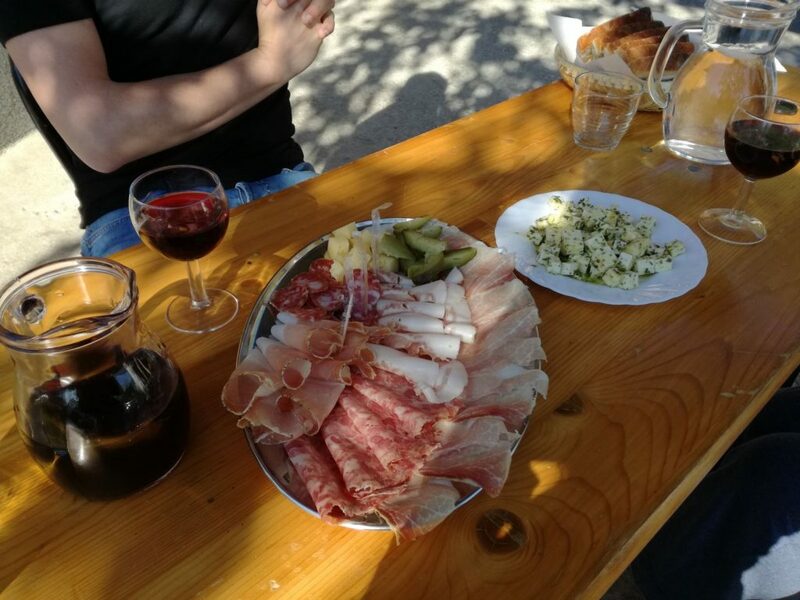 Visit a family-run prosciutto drying facility, learn about traditional methods of drying karst prosciutto and taste karst gastronomic specialty kraški pršut under the 250-year-old mulberry tree. This karst delicacy is highly prized by gourmets and foodies from all over the world! Get acquainted with a Karst wine route. Slow down and enjoy village life in Karst region. Homemade jota stew, herbal omelette, štruklji and locally produced goat cheeses are must before taking some photos of karst landscape. Let’s finish our great day with a local red Teran wine. Na zdravje! get travel tips from a local English speaking guide. Perfect for … gourmet lovers who wants to explore Slovenian countryside on the western part of Slovenia! Price: 107 EUR/person (min. 2 people). The price includes local guiding, 3 gourmet food stops. Exclusions: extra food and drinks, transport, personal purchases. Gratuities and tips are highly appreciated. For now, cash only. Prices are slightly higher if there is only one person on the tour. IMPORTANT NOTE: Food Tour Karst region is partly vegetarian friendly!!! Dishes from the Karst region contain eggs, wheat flour, dairy products and nuts. If you have allergies on certain foods but still want to join us, you are more than welcome. Let us know in advance about your food restrictions! We enjoyed wonderful experiences with Vesna and Robi. They were warm and welcoming and very knowledgeable about their country - and that included food, wine, and politics! We spend an entire day in the wine country in the Karst region that included a lovely 6 kilometers hike. We stopped for a fabulous lunch at a gastro-farmhouse where we ate our fill of fresh, homemade bread, prosciutto, soup and dumplings. The wine was made on the farm and it was delicious, too. As we walked back through the village, we stopped for a wine tasting and filled our bottles with local Teran wine! There is nothing like having local people share their country. It was one of the highlights in our ten months of travel. The hike was not difficult and the trail wound through beautiful farmland and vineyards. Vesna is really knowledgeable about local food, wine and the environment.